DURING MY undergraduate studies at the University of Mississippi, I had the opportunity to participate in a study-abroad program in Belize. It was a month-long study of the coral reef ecosystem and the fishes near an island off the coastline. This was our classroom in Belize. We lived on the island of South Water Caye. It was a small island, teeming with wildlife. At night, hermit crabs wandered the island in droves. It was impossible to navigate the winding sand pathways without seeing thousands of them. During the day, we attended class sessions and snorkeled the coral reef. It was my first experience snorkeling a huge reef system. It’s hard to describe how beautiful it was. In every nook, there was life. From great barracuda to tiny cleaner shrimp, every inch of the reef was covered. The first day was amazing. I put my gear on, not knowing quite what to expect. The water in the Caribbean is crystal clear. I snorkeled over a huge, shallow sea-grass field and into open water. I could see large rocks in the distance, and as I approached, it looked like I was swimming into a rainbow. The fish were brilliantly colored — both large and small — and they were everywhere! Sea fans swayed in the currents, and fish darted to their respective niches in the reef. It was amazing to see so many species coexisting in one system. Even though the class work was interesting, we lived for our time in the water. Swimming in groups, my classmates and I began exploring the reef. One swimmer picked up a large hermit crab to get a closer look. Just a couple of seconds later, we noticed a shiny spear coming straight at us. It was a great barracuda. My friend immediately dropped the crab, just moments before he would have been hit by the large fish. We hadn’t even seen him, but the fish had definitely seen the easy prey we exposed. The fish circled us a few times and swam off. After that, we all became more aware of our surroundings. I saw many beautiful creatures during my stay in Belize, including green sea turtles, manta rays, eels, sharks, tarpon, lobster and seahorses. The sighting I enjoyed the most occurred on the day we snorkeled an atoll (a ring-shaped coral reef that forms around underwater volcanoes). 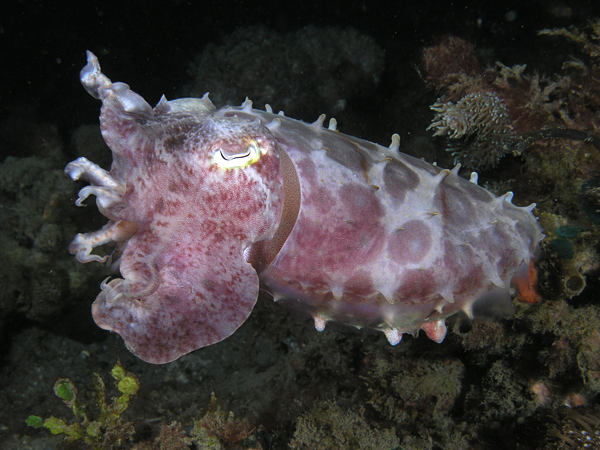 It was during this dive that we spotted a cuttlefish, an animal that looks a lot like a squid. The cuttlefish swam directly beneath me and appeared to be curious. As he stayed close to our group, he flashed many different colors: red, yellow, purple, pink and even zebra-looking stripes. He also flashed glowing neon yellow, which was amazing. He followed us for some time and then swam back into the depths. It was incredible to see this creature displaying his gorgeous colors and looking at us with as much curiosity as we had for him. Diving in Belize was amazing — an opportunity I will never forget. Of all the wildlife experiences I have had in my life, none have been more thrilling or beautiful. I got a chance to go to Belize one summer and I agree that it is one of the most beautiful experiences ever. I saw all the life you are talking about as well and it’s definitely a memory that will last a lifetime. I didn’t see a cuttlefish, but I bet it was amazing! I am hoping to take my daughter for her graduation gift next summer. Belize’s many diverse ecosystems are absolutely amazing as you witnessed firsthand. I actually have a pic of the barrier reef set as my desktop wallpaper. The sheer beauty of the reef and its surroundings should be in everyone’s bucket list. Even if you are not an avid snorkeler or diver it is still a must see.